The playoffs are nearly upon us but there’s still room for a few shocks in the final week of NFL regular season action. 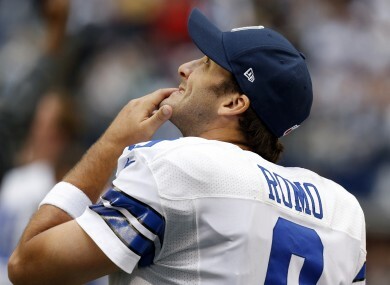 Tony Romo knows nothing less than a win will do for the Dallas Cowboys on Sunday night. AFTER 240 HARD fought games through 16 weeks of action, the NFL regular season comes to an end this weekend but, thanks to some clever scheduling, it could all come down to the final kick of the final game on Sunday night. For the Washington Redskins, their turn around in fortunes could hardly be more dramatic. This time last year, they were staring into an off-season of discontent, with the future of their franchise hanging on the shoulders of an untested college quarterback they weren’t even guaranteed of drafting as they only held the third overall pick. This year, they’re on the verge of not just the playoffs but their first NFC East title since 1999. While the Redskins could conceivably lose on Sunday night and still make the playoffs (both the Bears and Vikings would have to lose too), their opponents, the Dallas Cowboys must win to make the postseason. It’s not often a team not called the New England Patriots is ranked 28th on defence in the NFL and makes the playoffs but that would be the case were the Redskins to hold out at home to the Cowboys on Sunday night. They’ve been particularly bad against the pass where they are giving up 287.7 yards per game. However, thanks to a combination of the league’s fifth ranked run defence and number one run offence, the ‘Skins have put their destiny in their own hands. The Cowboys have coped better than expected with off the field issues this year and face the exact same scenario as they did in the final game of last season; win and they’re in. In 2011 they fell to the New York Giants on the final day and a heart-breaking overtime loss to the Saints last weekend is hardly ideal preparation for putting it right this year. Verdict: It’s easy to forget the Redskins were 3-6 not so long ago but their six-game win streak is even more impressive when you consider two of the victories are owed to their backup rookie quarterback. The Cowboys face their third win-and-they’re-in final game in four years. They’ve lost the last two and I fully expect them to make it an unwanted hat-trick on Sunday. Washington by 5. With 53-man NFL rosters, it’s difficult to call any organisation a one-man team but, without Adrian Peterson, the Vikings wouldn’t even have the slightest sniff of the postseason. Peterson’s 1,898 yards and 11 touchdowns through 15 games have more than made up for a shaky defence and inconsistent quarterback. Yet, despite their limitations, a win at home against the Packers will see them into the playoffs for the fourth time in eight years. 208 yards shy of Eric Dickerson’s single-season rushing record, it’s unlikely Peterson will reach that target against a Green Bay defence giving up just 111 yards per game on the ground. However, if he comes close, the Vikings have a real chance of making the postseason. The Packers, meanwhile, have already secured a playoff appearance but a win will give them an all-important first round bye so don’t expect to see Green Bay resting starters in the way they have done in recent years. Verdict: The Packers are perfect in the NFC North this year but it’s difficult to see them get to 6-0 with so much at stake for the Vikings. Minnesota by 3. The NFL loves nothing better than a fairytale and Chuck Pagano and the Indianapolis Colts have provided a script this season that even the most hardened cynic would shed a tear over. Last year, the Colts were the worst team in the NFL. This season, despite Pagano fighting cancer, the Colts have already secured their playoff berth with a game to spare. The Texans have been struggling since mid-November and have lost three of their last five, two of them in blow-outs. That’s not exactly Super Bowl winning form from the team many ranked as the best in the NFL not so long ago. Depending on other results, these two could well meet for the third time in under a month in a few weeks’ time and few would be surprised if it were the Colts who emerged victorious. Isn’t that the happy-ending Hollywood craves? Verdict: Pagano and the Colts have shown that life is much more than just football this season but they’ve a job to do now and their playoffs really start here. Indianapolis by 3. Email “The Redzone: Win and you’re in”. Feedback on “The Redzone: Win and you’re in”.